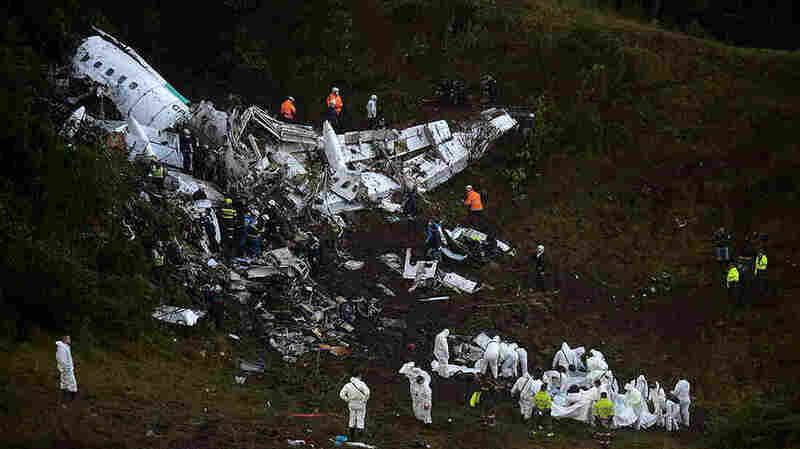 Plane Carrying Brazilian Soccer Players Crashes In Colombia, Killing 71 : The Two-Way The Chapecoense soccer team was flying to Medellin for a tournament when the charter plane crashed in a mountainous area late Monday night. Five people survived the crash. Rescuers search for survivors from the wreckage of the LAMIA airlines charter plane carrying members of the Chapecoense Real football team. The plane crashed in the mountains in Colombia late Monday, killing scores of people and leaving only a handful of survivors, officials said. A plane carrying a Brazilian professional soccer team crashed in the mountains near Medellín, Colombia, late Monday, killing 71 people. Five people survived the crash of the charter plane, according to authorities. Officials initially reported that the plane was carrying 81 people and that, variously, 75 or 76 of them had died. "The British Aerospace 146 aircraft was carrying Brazil's Chapecoense soccer team to a tournament in Medellín, Colombia's second-largest city," John Otis reports for NPR from the Colombian capital, Bogotá. "The plane had departed from the Bolivian city of Santa Cruz but reported an electrical emergency shortly before crashing late Monday night," he says. Reporter Pablo Medina Uribe spoke with NPR's Morning Edition and said it's still not clear why the plane went down, although some are speculating it may have run out of fuel. "What we do know is that when the plane crashed, it broke into two parts and didn't catch fire," he said. "So that's why one of the theories — the one about the fuel running out — is getting some ground. But we still don't know anything for sure." The crash site is located in a hard-to-access area and rain has hampered rescue and recovery efforts. "Dozens of rescuers working through the night were initially heartened after pulling three passengers alive from the wreckage," The Associated Press reports. "But as the hours passed, and heavy rainfall and low visibility grounded helicopters and complicated efforts to reach the mountainside crash site, the mood soured to the point that authorities had to freeze until dusk what was by then a body recovery operation." 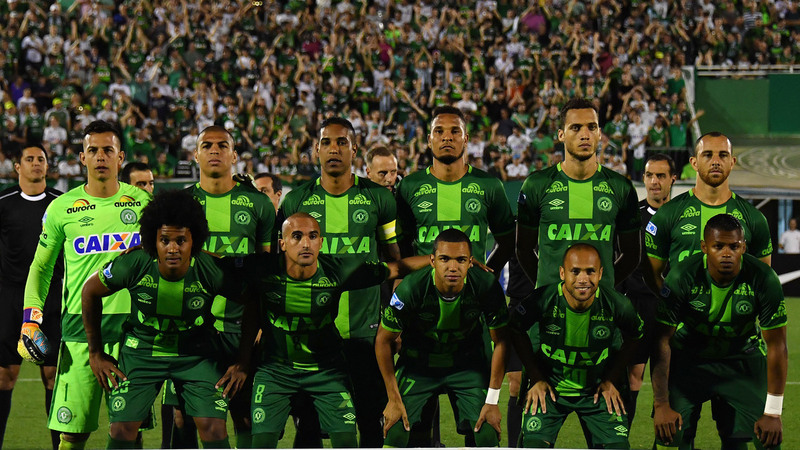 Brazil's Chapecoense players pose for pictures during their 2016 Copa Sudamericana semifinal against Argentina's San Lorenzo in Chapeco, Brazil, on Nov. 23. Most of the players on the team died in a plane crash in Colombia late Monday. Later Tuesday, Colombia's Ministry of Transportation said in a statement that a flight data recorder was recovered from the site and is now in the hands of investigators. The team that was traveling on the plane, Chapecoense, is a first-division soccer team from the southern Brazilian city of Chapeco, scheduled to play in the finals of the Copa Sudamericana tournament on Wednesday, John Otis reports. The team was having a "fairytale year," Catherine Osborn reports from Rio de Janeiro. "After almost going bankrupt 3 years ago, it defied critics this year by fighting its way to its first international tournament, the Copa Sudamerica," she says. Otis says that the survivors of the crash include a Brazilian journalist and two of the players for Chapecoense. A previous version of this post misspelled the name of Brazil's Chapecoense soccer team as Chapocoense.